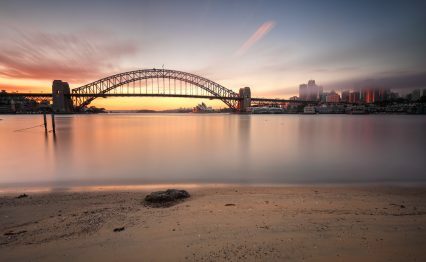 Sunrise views of Sydney Harbour, Harbour Bridge, Opera House and city buildings. The sun lights up the clouds, water and sides of the buildings in warm hues of orange and red, whilst low lying fog moves across the buildings. Long exposure. More than a third of Australian borrowers expect to have a bigger demand for trade finance over the next year. A report from research firm East & Partners shows that despite geopolitical and economic headwinds, confidence Down Under is high. Australia is currently on a record run of unchanged interest rates, which are expected to be raised later this year. This is expected to place further pressure on pricing, at a time when banks’ wallet share is already eroding. Meanwhile, the threat of protectionism looms large across Asia Pacific supply chains. The research company interviewed CFOs or treasurers from 1,881 enterprises, however, finding that 36.6% expect to borrow more over the coming year. Companies are particularly buoyant about the potential opportunities brought by China’s Belt and Road Initiative, which is set to span to the farmlands of Queensland. China already has a huge foothold in the Australian export market, but as the Australian government embarks on a substantial infrastructure building programme, Chinese capital is expected to play a key role. Steadily high commodity prices also look good for an economy which disappointed analysts last year, growing at 2.4%. In the first quarter of 2018, however, export growth beat expectations, coming in at 3%, suggesting that the Australian trade economy is growing in line with the rebound in global trade growth. The research suggests that borrowers are positive about the ongoing digitisation of trade finance, while there’s also positivity about innovation over new products in the sector. Furthermore, an increase in bank churn suggests borrowers are becoming more flexible. Commenting on the report, Martin Smith, head of markets analysis at East & Partners, suggests that banks could be in for a tougher time as pricing comes under further pressure. “Pricing competitiveness continues to increase as margins come under pressure, evidenced by higher customer churn intentions as middle market enterprises in particular plan to switch some or all of their trade financing business to another bank, be it a big four, international or non-bank offering,” he says.